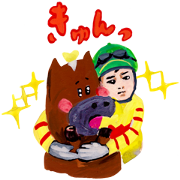 Brace yourself for the final furlong with these Arima Kinen UMAnication stickers drawn by Keiko Sootome! They’re great for horsing around in your chats! Friend JRA Arima Kinen Challenge’s official account to get the set for free.